Volunteers allow Ponderosa to run smoothly. They help us out in every area imaginable: Running equipment, cleaning buildings, wiping tables, sewing curtains, greeting kids in the snack bar. Our ministry would not be as effective without them. WOULD YOU CONSIDER GIVING A DAY, A WEEK, OR MONTH at a time? Our busiest season is May thru October. We first heard of Ponderosa through a South Carolina couple, Jim and Betty Cumbee, who had volunteered previously. We were interested in doing volunteer work out West after we completed an elk hunt. So in the fall of 2011, we gave Ponderosa a call! 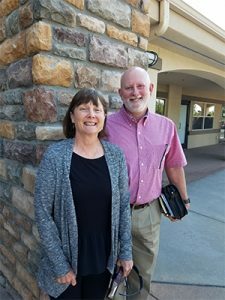 Volunteer Coordinator, Clint Walker, was excited to hear from us, as they had just completed a busy summer and were praying for relief volunteers. It was such a good experience that we have been coming back ever since. Thought about doing a mission trip at Ponderosa? Well, we have projects for you! In the past, groups have adopted a project by sending funding for materials and bringing workers to complete it. We've had groups remodel, paint, replace windows, build decks, and various other projects. This is a tremendous help for our Ponderosa Full-Time Staff trying to deal with day-to-day responsibilities. If you'd like to be a seasonal volunteer or adopt a mission project, call today for more information.